The North Island Hospitals Project (NIHP) has been recognized by the Canadian Council for Public-Private Partnerships (CCPPP) for innovation and excellence in public-private partnerships. 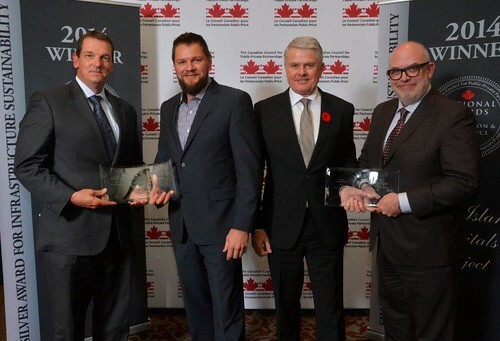 The project received the Silver Award for Infrastructure Sustainability at a ceremony November 3rd in Toronto. The North Island Hospitals Project (NIHP) is hosting a new round of its regular quarterly community information sessions to provide updates on the new $331.7 million, 153-bed Comox Valley Hospital and the new $274.5 million, 95-bed Campbell River Hospital, both slated for completion in late 2017. Wednesday, Dec. 3rd, 2014, 7:00 p.m. – 9:00 p.m.
Where can you find unique training opportunities with the best view in town? The answer for the Campbell River Fire Department came in October 2014, not long after the first of two huge tower cranes was erected at the new Campbell River Hospital construction site. See the City of Campbell River news release here.